« Did Fast & Furious: Supercharged at Universal Studios Change A Potentially Racially Charged Moment? Well, this is interesting. On Universal Orlando’s social media accounts, it seems that they have officially announced their new nighttime spectacular. But not really….? If you recall, in early June 2018, we ran a story saying that Universal Orlando accidentally released the name of their new show as well as highlights and segments guests can expect. This was, in essence, a fluke. The website released it in their coming soon section, yet no social media accounts were echoing the same info nor was there a press release. I even mentioned that the info we posted would most likely be pulled shortly after we posted it. Sure enough, within less than 24 hours, that information vanished from the “coming soon” section of Universal Orlando’s website. Now on June 14, 2018, we have a new announcement! Kind of. That same information has now reappeared on the “coming soon” section of the Universal website with a new name! 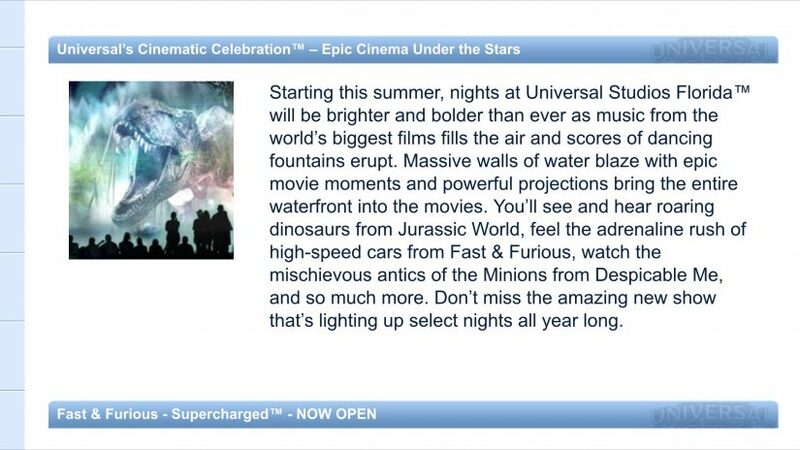 Originally, the name was “Universal’s Cinematic Celebration – Epic Cinema Under The Stars” an absurdly long name for any theme park show. Now the show is simply known as “Universal’s Cinematic Celebration” which is much easier to say and repeat by park employees and guests. Sadly, they dropped the “epic” portion of the title which has been part of the title for months. What we don’t know? When it will open. If it will be part of Universal Virtual Line (we believe it will) and how many shows will be performed nightly. It feels like they made this announcement since they had already leaked similar info earlier. My understanding is the heavy rain season in Orlando along with some other technical challenges has pushed the opening date of this show back beyond what Universal Orlando officials have hoped. Let’s keep our fingers crossed that we see some more concrete announcements soon as I do think this will be the sleeper hit of Orlando attractions in the summer of 2018! This entry was posted in Universal and tagged Nighttime Show, Universal Orlando, Universal Studios Florida. Bookmark the permalink. Trackbacks are closed, but you can post a comment.